Have you ever been frustrated because you couldn't reach the fish? Cast Pro Series Factory Surf rods are designed to reach the fish feeding beyond that 2nd bar! Cast Pro Series factory built rods are high-quality carbon fiber rods designed for surf anglers who want to maximize their casting distance. High quality FUJI guides and FUJI reel seats are standard on all factory rods. 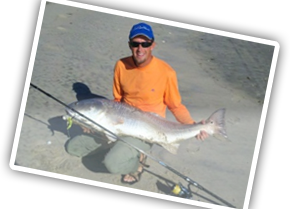 Designed and developed by renowned distance casting champion Tommy Farmer, the "Carolina Cast Pro". CPS Factory Built Rod 10ft. 1-4 oz. CPS Factory Built Rod 11ft. 2-5 oz. CPS Factory Built Rod 12ft. 3-7 oz. CPS Factory Built Rod 12ft-8in 4-8 oz. CPS Factory Built Rod 13ft. 3-6 oz.